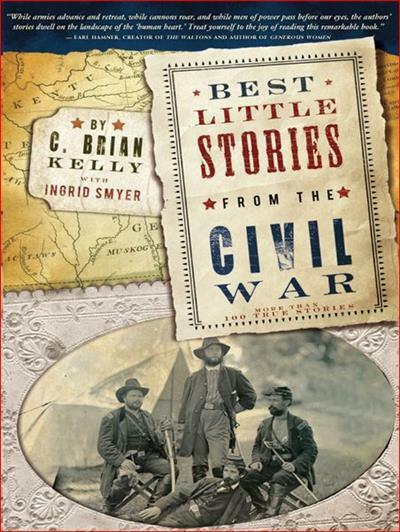 C. Brian Kelly, "Best Little Stories from the Civil War: More than 100 true stories"
"This fascinating book will make the Civil War come alive with thoughts and feelings of real people." The Civil WAR You Never Knew. Former U.S. Senator Robert Toombs of Georgia, who warned the Confederate cabinet not to fall for Lincoln's trap by firing on reinforcements, thereby allowing Lincoln to claim the South had fired the first shots of the war at Fort Sumter. Brig. Gen. Stephen A. Hurlbut, who disbanded the 13th Independent Battery, Ohio Light Artillery, scattered its men, gave its guns to other units, and ordered its officers home, accusing all of cowardly performance in battle. Thomas N. Conrad, a Confederate spy operating in Washington, who warned Richmond of both the looming Federal Peninsula campaign in the spring of 1863 and the attack at Fredericksburg later that year. Private Franklin Thomson of Michigan, born as Sarah Emma Edmonds, who fought in uniform for the Union during the war and later was the only female member of the postwar Union Grand Army of the Republic.